Today the combatants of the C.E.F. rest in the French military cemeteries of Rome and Venafro. With a surface area of 76,000 square metres, the two sites house 6,055 bodies (4,345 in Venafro and 1,710 in Rome) buried in individual and communal graves. These are decorated with Christian crosses, or Muslim, Jewish or animist stelae [commemorative stone or wooden slabs], depending on the religion of the person buried, who died for France. Venafro was the site of the C.E.F.’s H.Q. during the fighting. 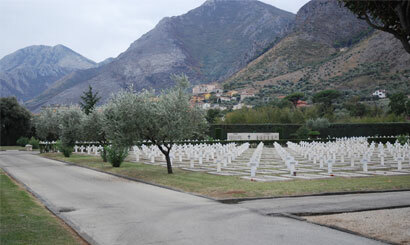 Today the Venafro cemetery reunites the soldiers who died at Belvedere and in the hospitals of Naples (4,922 graves). The Venafro cemetery has a Christian and a Muslim burial plot. These military cemeteries have a history of their own. At the end of the fighting in 1944, there were 55 small French military cemeteries and the army carried out hasty burials close to the battle sites. As a result there were more than 2,000 isolated graves in the Abbruzi mountains, along the Garigliano, in the Lazio region, and beyond Rome, towards Sienna, the banks of the Arno, and on the Island of Elba. 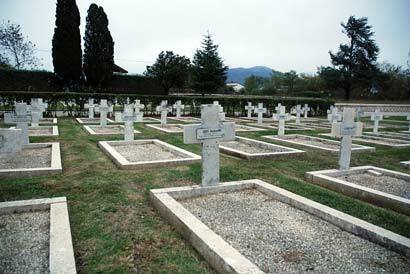 After the war, France decided to create three cemeteries in Italy. The work was carried out under the aegis of the French military command in Italy, under General Louchet and later under General Le Coulteux. The Civil Status and War Graves Department of Major Morlot and the Engineering Works Department were merged into a Cemetery Works Board under the authority of Major Ruze. Furthermore, the State financed the repatriation of the bodies to France for those families who requested it which explains the significant number of purely commemorative [unoccupied] graves. The exhumations of the bodies began in October 1944 and the re-burials were carried out at the Miano cemetery near Naples, which was fully laid out by November 1945. Work began at Venafro in 1945, and at Rome in 1947. Marshal Juin opened Miano and Venafro on 1 and 2 November 1946 respectively. In Rome, on 5 December 1946, he laid the first stone of a commemorative monument, which was completed by the sculptor Fenaux in 1948. It took several years to finish the process of exhuming and repatriating all the bodies. When they were completed, the three cemeteries housed a total of 7,037 graves of which 4,600 were Muslim, which testifies to the involvement of the former French colonies. At Miano, a koubba [Muslim monument] was erected, consisting of three unknown North African soldiers (an Algerian, a Moroccan, and a Tunisian). At Venafro, a minaret was built. The three cemeteries each included three Christian chapels. The deterioration of the grounds of the cemetery at Miano led to its closure in 1991 and the graves were transferred to Venafro. Of the 1,719 graves (of which 485 were purely commemorative) 849 were Muslims, 344 Christians, 22 Jews and 19 animists. In June 1992, the Venafro cemetery was renovated. A parade ground was created and two memorial walls were built showing the names of the soldiers whose bodies had been returned. The minister for ex-servicemen and victims of war, assisted by the Consulates General of Rome and Naples, ensures that the two cemeteries where the French War Dead rest in an eternal grave will remain as a permanent memorial. The Venafro cemetery is a place where the feat of arms of the C.E.F. is constantly commemorated. Venafro is a burial plot granted to the French state by Italy, and held in perpetuity.